The Indonesian archipelago of the Moluccas (or Maluku Islands), commonly referred to as the Spice Islands, lies on the equator north of Australia and west of New Guinea. 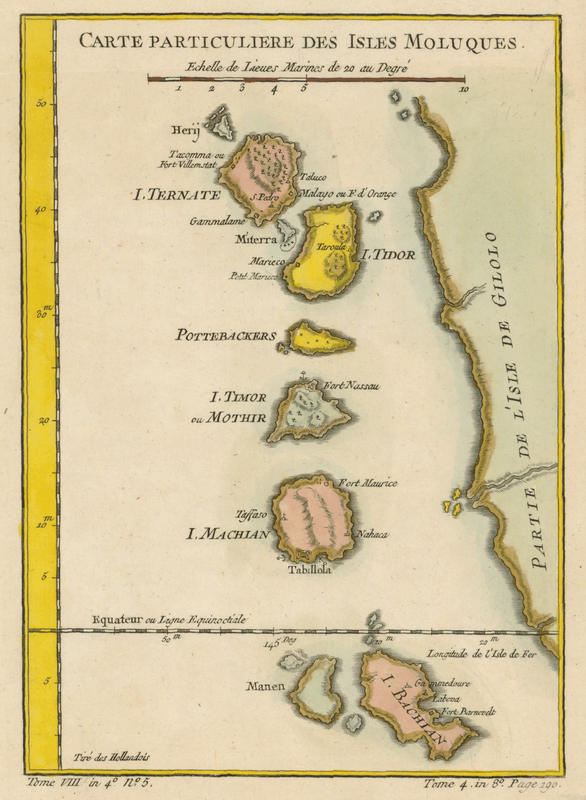 Though there are hundreds of islands in the group (most are very small), only a handful figure prominently in the history of the European spice trade, including today’s Ternate, Tidore, Moti, Makian, and Bacan—essentially the ones shown on the surrounding maps. 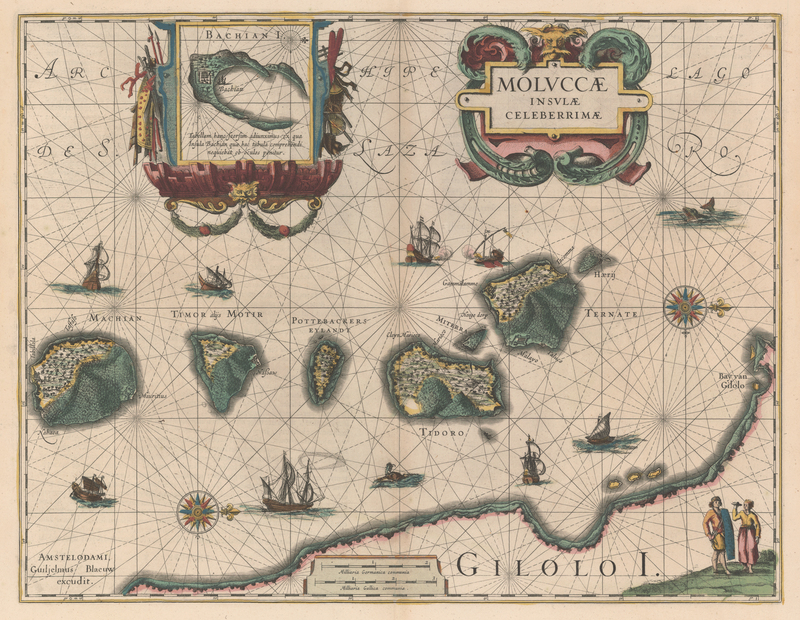 Until the 1700s, these rain-forested, luxuriant, volcanic islands were the only or best sources of such spices as cloves, nutmeg, and mace. Arab traders introduced cloves to Europeans around the fourth century but sought to keep their sources secret. Their monopoly was broken by the Portuguese after Vasco da Gama’s voyage to India around the Cape of Good Hope in 1497. The Portuguese strengthened their stranglehold on the spice trade during the sixteenth century, when they found the central locus of the spices to be these islands. One of the native traditions was to plant a clove tree when a child was born, linking the child symbolically to the life of the tree. When the Dutch took over control of the Moluccas in the seventeenth century, they eradicated the clove trees from all the islands except Amboina (and a few adjacent islands) in order to enforce the spice’s scarcity, keeping prices high. As a result, cloves were worth more than their weight in gold. But, as one might expect, the Dutch tactic also instilled hatred and fomented rebellion among the islanders. Gradually, the spice was cultivated in other places of the world, like Brazil, the West Indies, and Zanzibar, reducing prices and making the commodity more available. However, the historical significance of these islands cannot be overstated. Largely because of the magnetic force of spices, European ships risked sailing into unknown waters (Portuguese ventures down and around Africa), “found” a New World (Columbus’s crossing of the Atlantic), and first circled the globe (Magellan’s crossing of the Pacific). *A bahar is a unit of weight approximating 400 pounds. 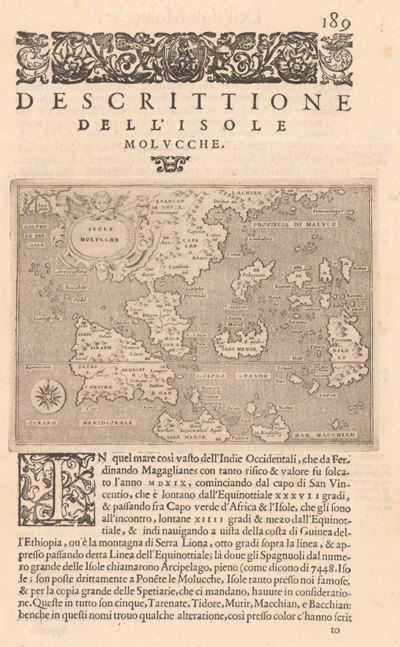 Following in the footsteps of his countryman Benedetto Bordon (1450-1530), Porcacchi issued an updated isolario, or island map book, in Venice in 1572. The book went through a number of editions through 1686 to meet the increasing demand for information about remote places, but the maps remained unchanged. 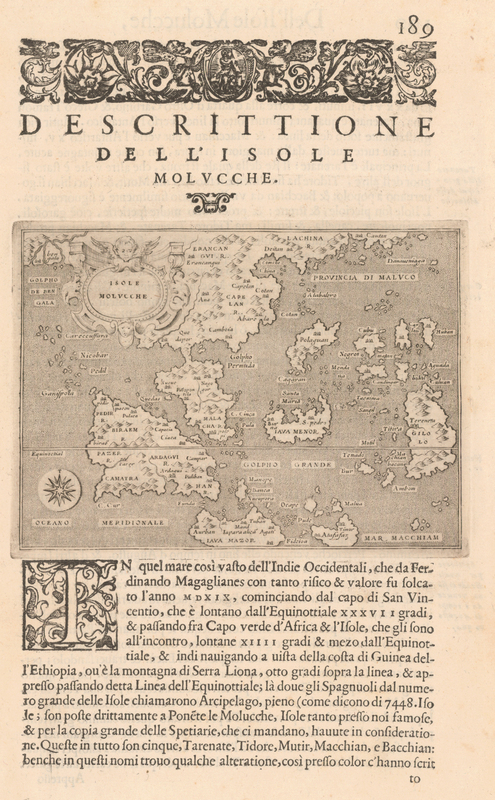 (Porcacchi copied the map, using a smaller format, from Girolamo Ruscelli’s edition of Ptolemy’s Geographia that was printed in Venice in 1561.) 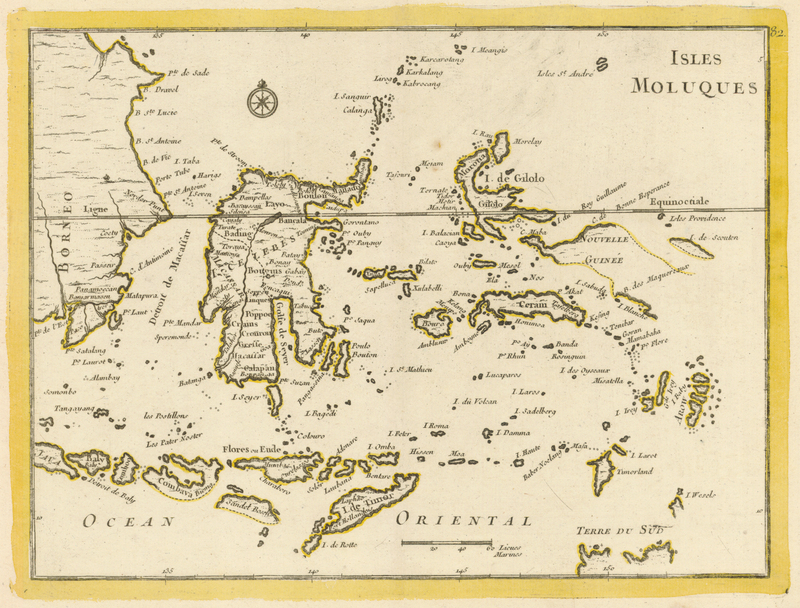 By naming the whole area the Moluccas, Porcacchi is probably reflecting the contemporary confusion on the exact whereabouts of the Spice Islands. 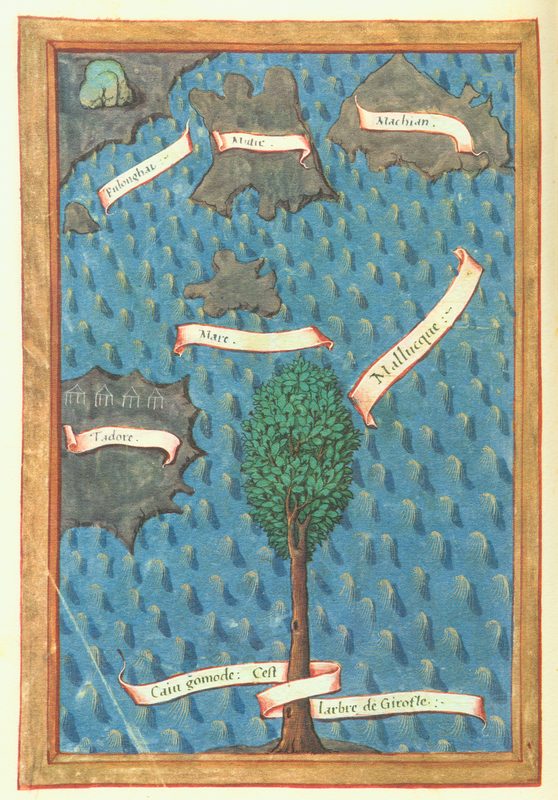 The copper-engraved maps of this mid-sixteenth century period represented the final transition away from the use of woodblocks that had dominated map printing since the beginning. 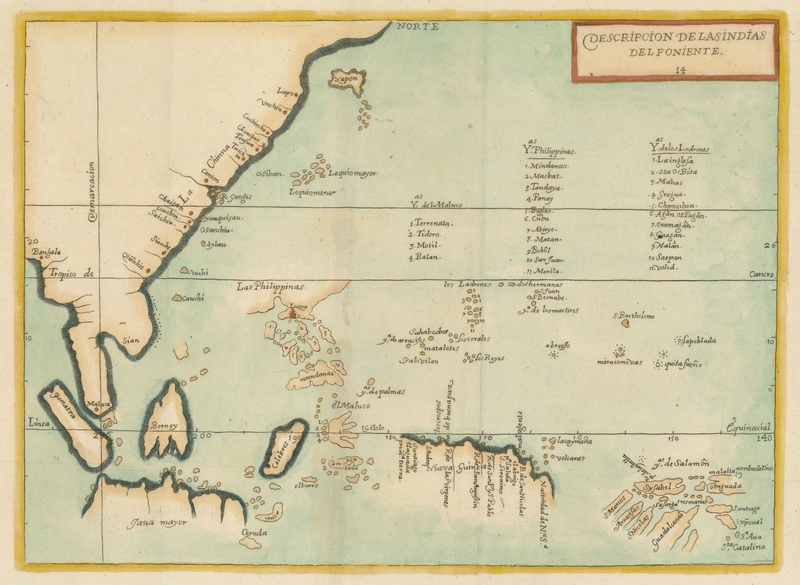 The earliest map to name all of the Philippine islands, based on the manuscript world map (ca. 1575) of Spanish court cartographer Juan López de Velasco. Appointed by King Philip II as the first historiographer of the Indies, Herrera devoted his life to writing accounts of the Spanish Empire, drawing on his access to official state papers. Here, his line of demarcation, separating the Portuguese and Spanish spheres of influence, runs just east of Malac[c]a, the Portuguese center of the East Indian spice trade, thus giving Spain most of the rest of Asia and the Pacific. Note also the highlighted Spanish settlement at Manila (founded in 1571) on the island of Luzon in the Philippines: it is marked with the red icon of a church, perhaps for the Roman Catholic cathedral that was constructed there in 1581 (or for the second one that was built in 1592). First large-scale map of the Moluccas, oriented with north to the right. The equator touches Tidore. 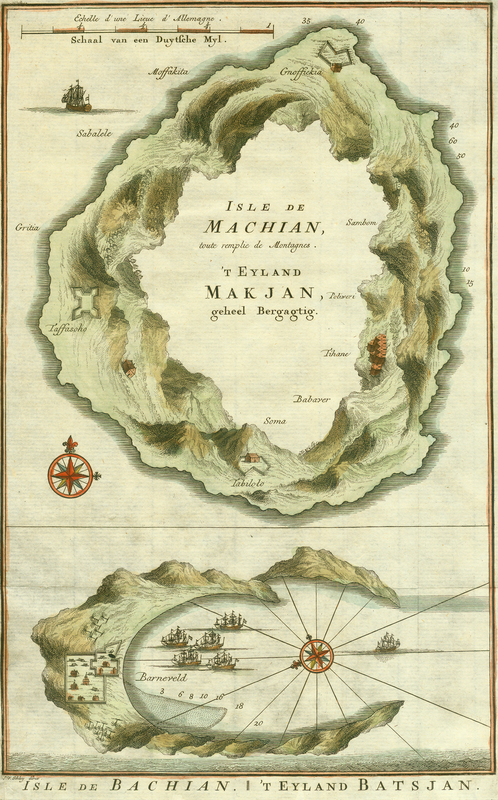 The inset map of Bachian Island (also called Bacan), framed with a military motif, shows the fort that the Dutch East India Company seized from the Spanish in 1609 and renamed Fort Barneveld; henceforth, the island’s cloves could be sold only to the company. 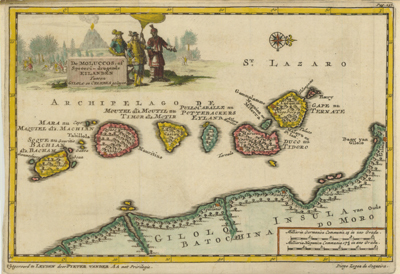 Gilolo (today’s Halmahera), shown at the bottom, is the largest island in the Moluccas, but for much of its history it was controlled by the sultan of the smaller island of Ternate, who yielded the larger island to the Dutch in 1683. 1669: Montanus, Arnoldus, 1625?-1683. “Ware affbeeldinge wegens het casteel ende stadt Batavia gelegen opt groot eylant Java anno 1669.” Copperplate map, with added color, 27 x 36 cm. Probably issued in Montanus’s Gedenkwaerdige gesantschappen der Oost-Indische maatschappy in ’t Vereenigde Nederland . 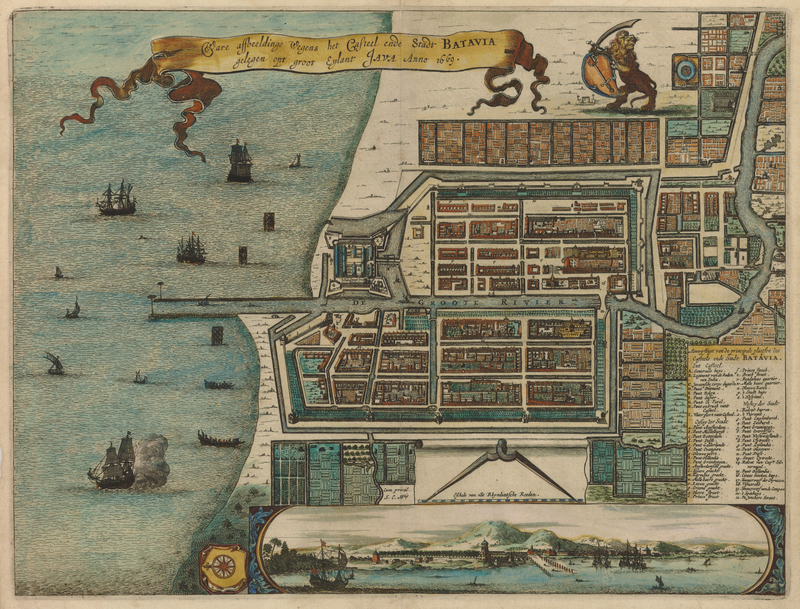 . . (Amsterdam, 1669) [Historic Maps Collection]. Batavia (today’s Jakarta on the island of Java, Indonesia) was the headquarters of the Dutch East India Company (Vereenigde Oostindie Compagnie in Dutch, or VOC). Founded in 1619 by Jan Pieterszoon Coen, the company’s governor general of the Moluccas, the city featured magnificent homes of wealthy Dutch merchants as well as pestilential canals, which were the scourge of many visiting sailors whose ships stopped for supplies and repairs on their way home to Europe. The place figures prominently in many of the voyages of explorers in the Explorers section. The Moluccas, though highlighted in this map, appear lost in the pantheon of islands that constitute the East Indies. 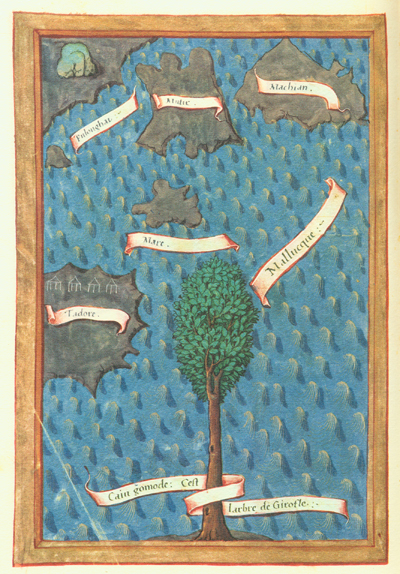 The navigational difficulties for early European explorers seem almost insurmountable. Note that the equator has moved south and now passes between Machian (Makian) and Bachian (Bacan). Oddly, the western peninsula of New Guinea is presented as an island (Terre des Papous). In the background of the map’s cartouche a volcano erupts while men harvest spices. In its foreground, Dutch merchants presumably discuss trade with a spice island sultan. 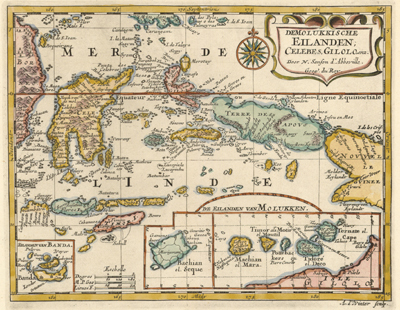 Though the Moluccas are now firmly established, the map is less certain about the contours of New Guinea: previous shorelines are now dotted lines. These two maps emphasize the volcanic nature of the Spice Islands. Part of the Makian volcano was blown away in 1616—hence, the empty center. 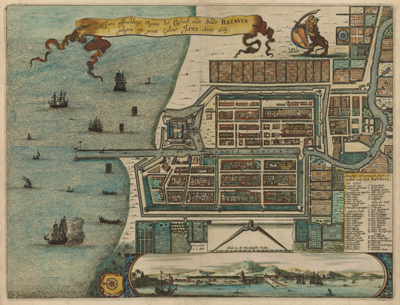 The map of Bacan shows Fort Barneveld, indicative of the Dutch presence and power in the islands. The view of the Spice Islands that persisted through the rest of the century.